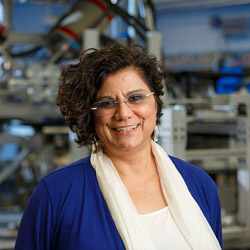 Ani Aprahamian, Freimann Professor of Physics, has been named co-chair of a committee with the National Academy of Science on a U.S. Electron Ion Collider Facility. The committee will assess the scientific justification of a U.S. facility taking current international plans and existing domestic facility infrastructure into consideration. It will address the role that a facility could play in the future of nuclear physics, considering the field broadly, but placing emphasis on its potential scientific impact on quantum chromodynamics. Aprahamian will co-chair the committee with Prof. Gordon Baym of the University of Illinois. The study will begin immediately, the committee will meet in December, and will conclude in 2017.